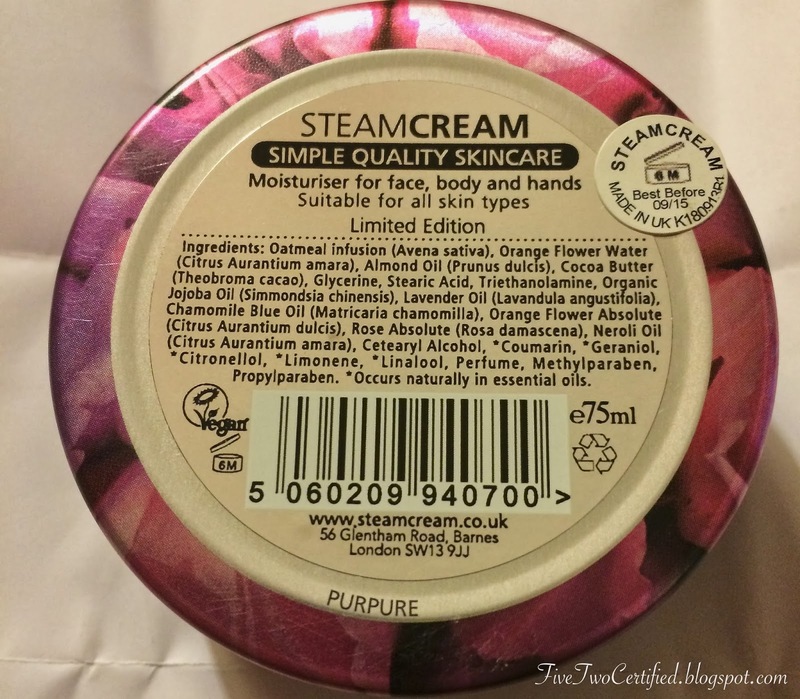 fivetwo beauty: Review: SteamCream an All in One Moisturizer! 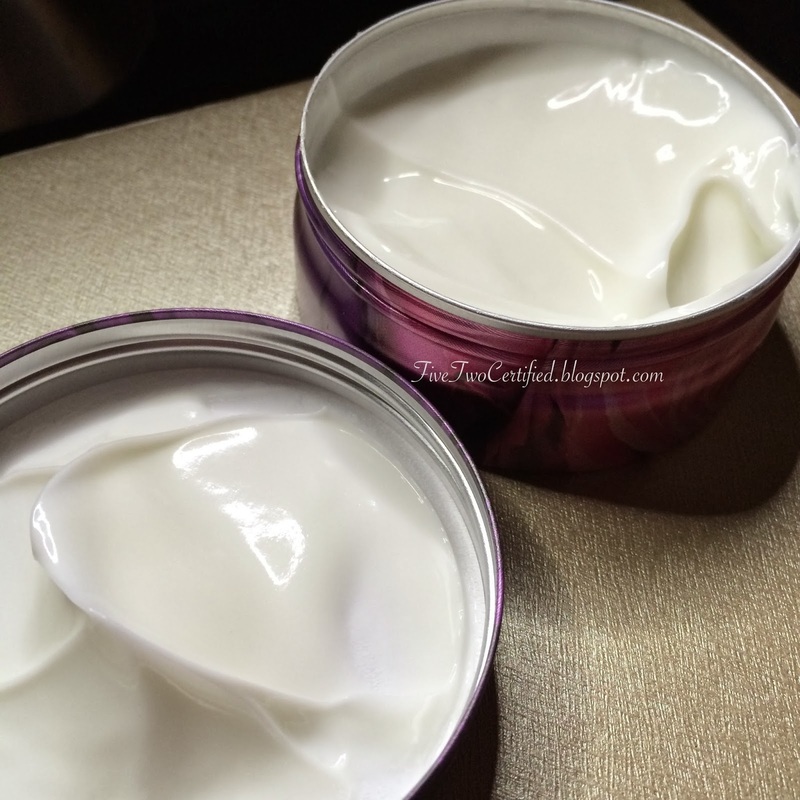 It’s STEAMCREAM’s unique STEAM process that makes our cream much more effective on the skin. The force of the STEAM fuses the ingredients instantly - holding them together in a very gentle and loose emulsion. When it touches your skin, the naturally moisturising ingredients and pure, calming essential oils are released from the light emulsion so they can sink past the surface reaching the areas they are needed fast. Your skin will feel intensively moisturised and softer for longer. "Freshly handmade using high-quality, natural ingredients that are fused together by a shot of steam. This unique method makes the cream very lightweight, providing long-lasting hydration for the face. The texture also makes it a perfect nourishing treat for your body and hands too." 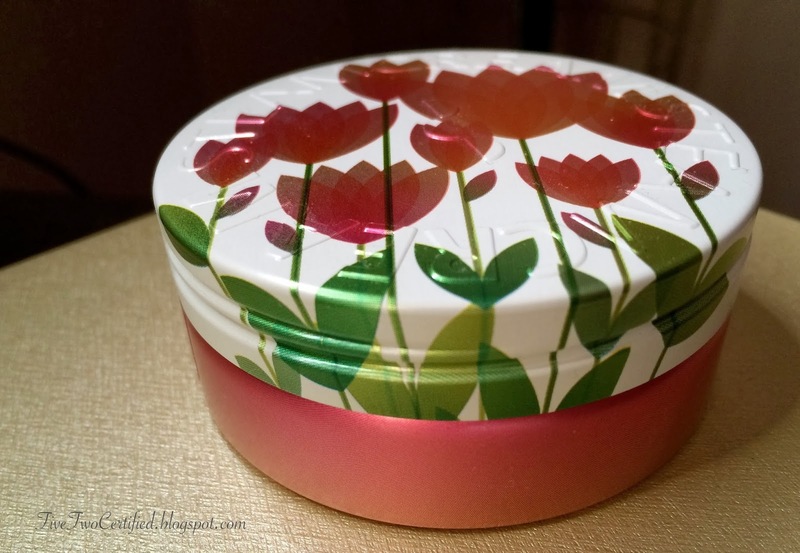 They are encased in these beautiful designed tins that can be reused for storage on anything you can think of! Candy, paper clips, hair pins, buttons, bracelets, etc.! The purple tin pictured above is the "PurPure" (design184). I also received another tin called "Pink Diamond" (design 338), that is a Limited Edition design that is released for Spring 2014. They are made in the UK and Japan. The packaging is just adorable! They are nice to keep by my desk or on my makeup vanity. Definitely easy to find my tin when my hands are needing of some Steamcream! 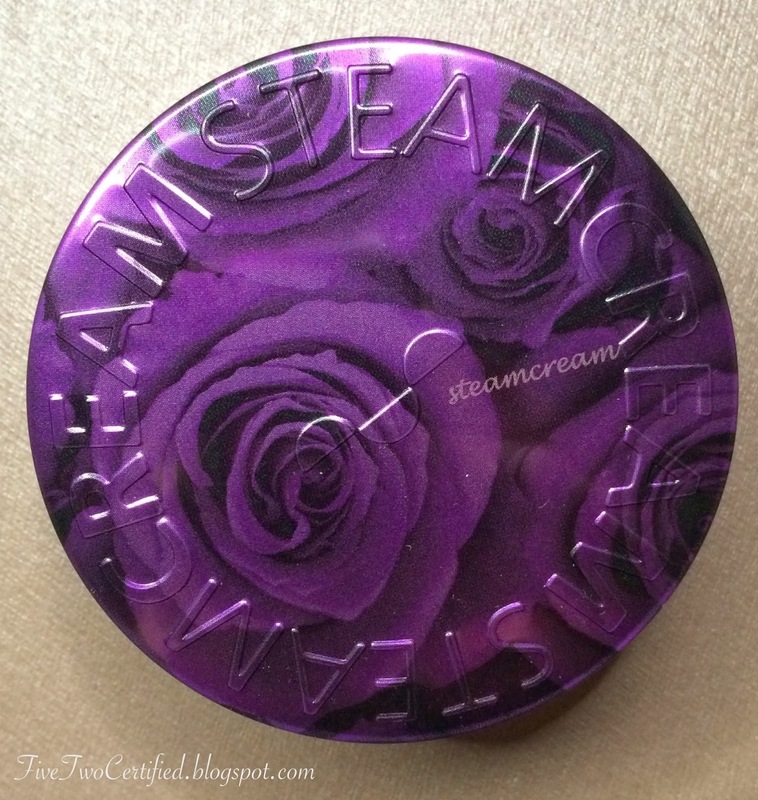 I am actually torn because I can't wait to re-use my tin but I don't want to finish my Steamcream too fast either. The tin is very travel friendly since it's a screw top. The Steamcream is a bit runny so do still be careful opening it. This has made my hands really soft and hydrated with this extreme winter weather temperatures! I am planning on using this on my face later on since my face is looking dull lately. I tried using this to give hubby a foot rub and I don't recommend this to do any body massages as the skin absorbs the Steamcream pretty fast! It has left my hubby's feet feeling soft and nice though! 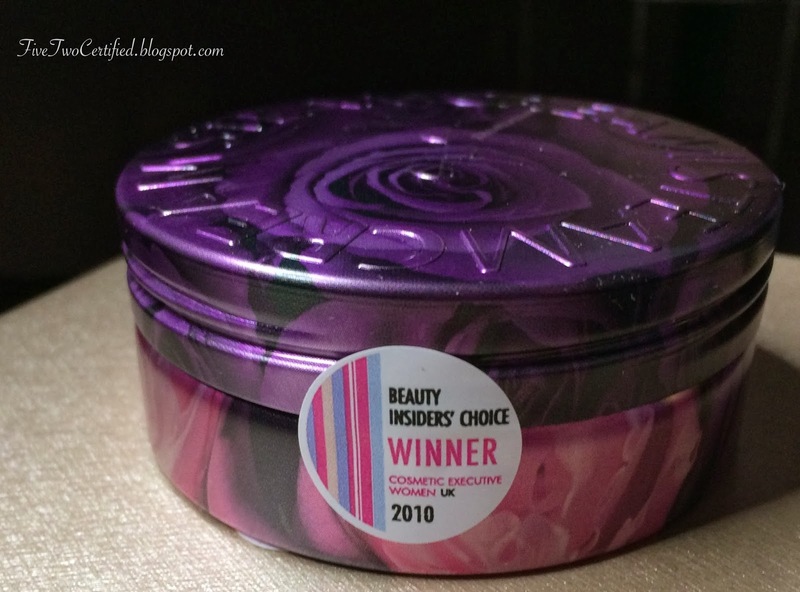 As most of the reviews I have read here in Blogger, this does have that herbal-medicinal smell once you open it, but this scent goes away as you apply this onto your skin. The smell is the result of all the natural ingredients used and so it just tells you that the company did not add any fragrance or perfume to the product. I prefer my lotions to be either naturally scented or non-scented at all, so I don't mind this smell at all which goes away pretty fast. I use this mostly at home and hubby is fine with the scent of it too. So if you are concerned of the scent just use it at home and not in public places! I have given my Purpure tin to Sis who is a new momma and loves products that are all natural so she and her baby can use it together! They have a one hour commute and with this harsh weather she is in need of a good cream to keep both their skin moisturized! All in all, this is a great product. I love that even after finishing your Steamcream you are left with a nice souvenir that can be re-used. I love it when a product comes on those packaging that I can re-use for something else around the house, like a Tupperware! This though comes in a nicer stylish tin of course! Price may be on the pricey side but just remember this is made with natural ingredients and is handmade. The results you get after using this product is definitely worth buying a tin for you and for others! Have you tried this product out? Have you seen the other tin designs they have? What would you get next? *disclaimer: This product was sent to me by Steamcream for review. All opinions expressed and stated on this post are solely my own.